Of course I’ve heard of Marie Lu before, but this was actually the first book by this author I’ve read, and yeah, I totally get the hype. This author can write! And the world she created? Wow! 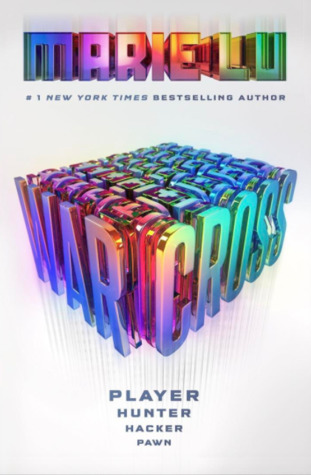 I’m in love with the world Marie Lu created for Warcross. It’s kind of my dream world, in fact. I’m not a huge fan of video games, but it totally gave me a The Sims vibe, and who isn’t obsessed with The Sims? Anyway, Warcross has the kind of world that draws you write in and makes you want to live inside the book’s pages, and in this case, inside the game (Marie Lue and) Hideo Tanaka created. The thought of putting on a glass and then going into a game like that leaves me salivating. The whole concept is new, fresh and unique!! You know what else I loved? The diversity portrayed in this book with characters from all over the world and non-white main characters, plus the outside-the-USA setting. There was a lot, a lot right with this book. Emika was such a strong character. She was so relatable and likable and badass. I loved how smart she was, and how she didn’t back down from a challenge. Go, Emika! Hideo was also my kind of love interest—mysterious, keeping a secret, hot and damaged. I wish I’d gotten to know him a little better, but I’m guessing that’ll happen in book 2. The romance was cute. I expected more from it, but I wasn’t necessarily disappointed in what I got. Emika and Hideo made a good couple and they shared some great scenes. Was it just me or the fact that the characters were upper YA suggested the romance would have a little more heat? *shrugs* It was probably just me. The only thing I didn’t exactly love about this book was the mystery around the villain and the people helping him. It was pretty obvious to me who was involved right from the beginning and I also guessed the identity of the villain when he was first mentioned in the story. I’m also guessing I know the motive behind the villain’s action already. Having said that, the plot twist involving Hideo and Emika caught me by surprise, so yay for that! Overall, this was an excellent first experience with this author. I know a lot of people love her books, and after reading Warcross, I’m more inclined to try her previous titles.